This class picks up where Expert Level 13 left off. In Level 13 we started learning about Update Queries. In today's class we will go over four more very popular examples of Update Queries. We will begin by learning how to "scrub" data. 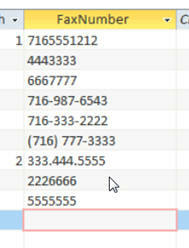 In this example, we've received a list of phone / fax numbers in a table, but there's absolutely no formatting in the table. We want to clean up the data so it's all in a unified format: exactly ten digits long and no punctuation (digits only). We'll use an Update Query for this. We'll learn how to use the Replace and Len Functions. In the next example, one of our clients recently changed their web domain name, so we need to edit the email addresses of all of their clients in the database and change xyz.com to abc.com. We'll learn how hyperlinks are stored in the table (they're not just simple text fields). We'll use the CStr function to display them as simple text. We'll see how we can use the HyperlinkPart function to break up the components of a hyperlink. We'll use the NZ function to convert null values to zero (or in this case, empty strings). Next is a very popular problem: how to split first name and last name into separate fields. I get emailed asking how to do this at least once a week. You've got a table that someone typed in the customer first and last names into a single field. We learned on day one that this is a big no-no. You should always put these in as separate fields, but whomever built the database you were given didn't know better. So, we'll learn how to split them apart. You'll learn how to use the InStr, Left, Right, and Mid functions to accomplish this goal. Our last Update Query example involves a table that someone gave you that wasn't properly normalized (relational). It's a list of employees with their departments typed in as text. Again, a big no-no. 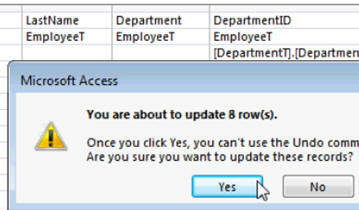 So you need to create a department table and then convert the department names over to Department IDs. Finally, we'll begin learning about Append Queries, which allow you to add records on to the end of a table, or copy records from one table to another. We will create a student table, and a daily attendance table. We'll run our Append Query to copy the list of students to the attendance table every day so that all we have to do is check off which students are absent, instead of having to enter ALL of the students EVERY day. 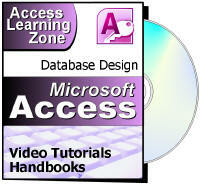 This is the 14th class in the Access Expert series. There's a lot of great material in this class. Learning Update and Append Queries will add tremendous power to your databases. Of course, if you have any questions about whether or not this class is for you, please contact me.